Mercure Hotel Aachen am Dom. Book online now! Free Wifi! Correct. I liked the option of not cleaning the room one day and donate an amount to a good cause or get a complimentary drink. correct. The room was very new and clean. The staff very nice. The only negative commment I have is that the pillow was really thick and firm for me and there were no alternatives besides a pillow for babies. What I really like is position in middle of city. Also friendly personal. Breakfast was wonderful. But I was little bit annoyed by morning noise from street (at 5 am, 6 am again) and dust on my night table next bed. Also somebody come to my apartment (and apologies) when I was taking shower. This should not happened in this kind of hotel. For a night out in center of Aken, this is a very good place. Parking is available in garage across the street. Push left button for hotel entrance. Lower level. Breakfast basic but ok for a start. Rooms clean, Some with balcony . the hotel lobby is smallish with few amenities but what they do provide is done well! We arrived late, after many travel challenges (delayed flight, stopped train, in the end taxi from Antwerp) and we were met by very friendly and courteous desk staff, who quickly got us checked in to our rooms and made us feel most welcome to Mercure Hotel Aachen am Dom. Our 5 night stay continued with outstanding service throughout. We were all extremely satisfied with our stay in Aachen. First I received a very small room with a tiny bed 407. But after requesting a better room I got a bigger room 411 immediately. Thank you for the immediate help. A comfortable room with satisfactory amenities. We appreciated particularly the hotel's central location. Enjoyed the buffet breakfast. The bar unfortunately was not staffed in the evening. We had to call the front desk receptionist for service. The staff were always friendly and helpful. I woke during the night several times because of the noise outside. Longest was at around 4am and there were several drunk people outside standing there for half an hour, loudly chatting. I couldn't even get back to sleep for an hour because of noise and anger. The isolation at the windows were horrible that I couldn't believe the windows were already closed. I give rating three because breakfast was very nice. Very good stay. Great breakfast, very good housekeeping, room was a little warm but opened window & no problem. Great friendly staff service. 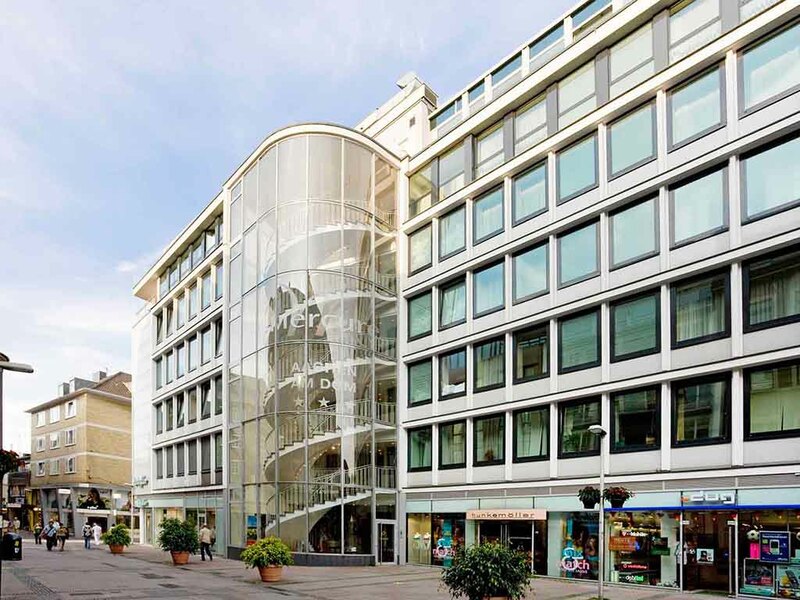 We always choose this hotel in Aachen.The center of the city as well the shopping center are located at walking distance from the hotel.The hotel has also his own parking just in front of the hotel.At check-in we received an upgrade to a suite. The Mercure Hotel Aachen am Dom located nearly in the center of Aachen and have it's own parking in the front of the hotel.From there it is very easy to visit the historical center of Aachen as well as the modern shopping area.We always use this hotel when we visite Aachen, as well in te summer as well for the Christmas market.At check in we received an room upgrade as a member of Accor Hotels. Very nice action from the front desk. The staff was very welcoming and made our stay extra special. The room was very nice, spacious and clean. The only negative point was the mattress, too soft for us so we ended up with a sore back in the morning. Return visit to Mercure Am Dom in last week of Advent. Excellent location for Dom and Christmas Market. Even I had booked by the application and check in was already done, the lady from the reception asked for an ID, and for a payment card!